I'll use Google Chrome as a web browser. I'll use jquery to produce smaller and easier code, because of its selectors and built-in ajax method. When page doesn't use that library already, we need to inject it. It will be shown later in "Live example" how to do that. On ajax-based pages it's better to disable origin policy checking by web browser, because sometimes ajax requests will trigger origin errors like "Origin http://www.example.com is not allowed by Access-Control-Allow-Origin". In google chrome we can do it by executing it with --args --disable-web-security parameter. You can read more about origin policies here and here. As you can see in index.html there is already included jquery library so there is no need to inject it. 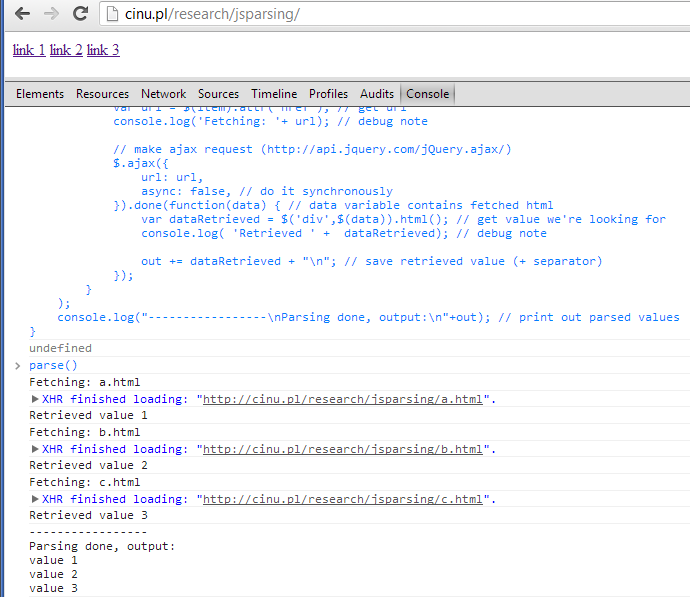 Go to http://cinu.pl/research/jsparsing/, paste above code in Developer tools console and hit enter. To execute this code just write "parse()" and hit enter. I guess this code is well documented, so there is no need to describe what it does, so lets try to do some more complicated example. The main goal is to fetch first 5 items from products category (I'll use wireless routers as an example) and check if there is any "feedback" from poland country on first page of feedback. This task seems silly and parsed data is rather useless but this is only example which helps me to utilize things I have previously written. 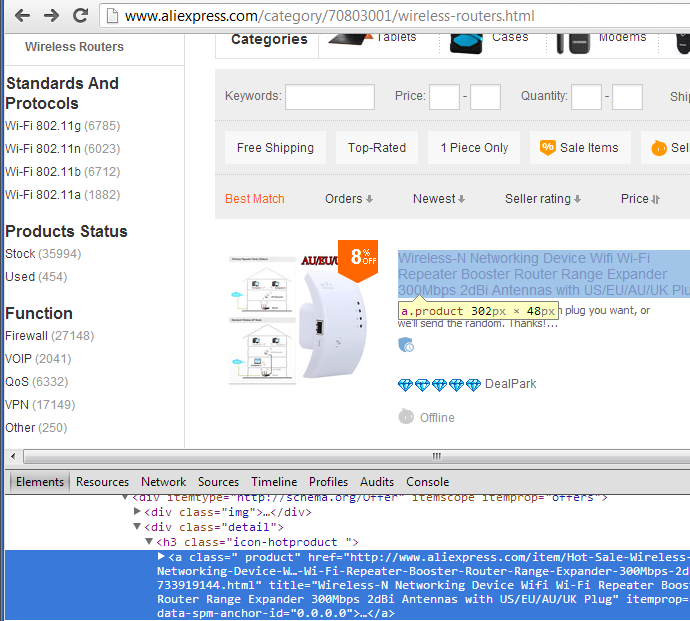 Since aliexpress doesn't use jquery we need to inject it. // Give $ back to whatever took it before; create new alias to jQuery. Step 3. Find a way to fetch feedback (cause it's dynamically fetched through ajax). First of all we need to get url where http requests for feedback data goes. To do that we need to look in Network tab of Developer Tools, press "Feedback" tab on web page and check "Documents" and "XHR" checkboxes (we don't need scripts, images, fonts etc.). It contains raw HTML response. When we look into "response" we will see that this is exactly what are we looking for. If you look closer you can see that productId is also in source code in window.runParams, so we will get it like adminSeq and companyId. 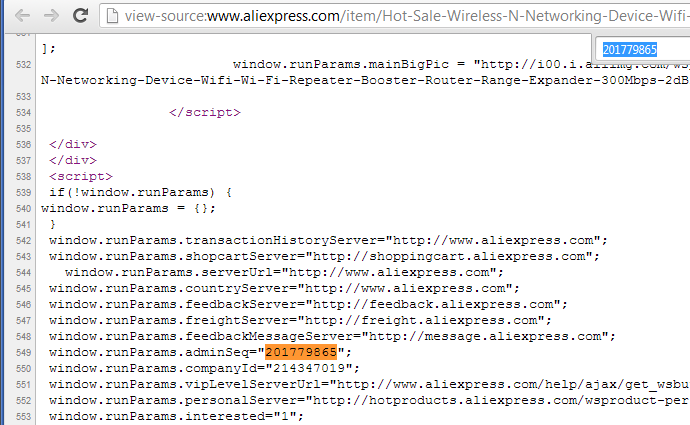 If we try to make ajax call on prepared feedbackUrl in our parse() function we will see in console that "Origin http://www.aliexpress.com is not allowed by Access-Control-Allow-Origin" browser error. In Google Chrome we can bypass it by adding --args --disable-web-security when we execute binary. We executing it with parse('pl') when we want to check if there is a feedback from poland. In above example we made operations on a raw html code, however using json is a lot easier, because we don't need to use regular expressions, jquery selectors, etc. to fetch data. Another thing is that we don't need to store data in console log. 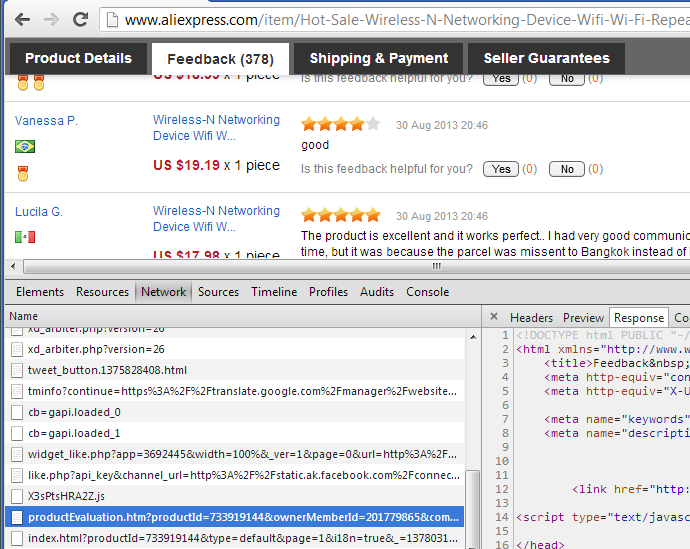 We can inject some div into webpage and then store results in it. I am really liked reading your nice articles. It looks like you spend a lot of time on your blog. I have saved it and I am looking forward to reading new articles. Keep it up the good work.